A girl is running. Two boys follow her. One of them knows her like a childhood sweetheart. The other is a new interest. A girl is running and I am running with her, or behind, or around, like a mind hovering against the skin of things, her legs maybe, her arms, very thin, inside which even more thinness celebrates bone. A girl is running. Two boys chase her. One of them is a sweet menace. He shouts that he knows her hiding place as she runs across a hilly field. I am in the vicinity, but do nothing. In not doing, one is more. I become more and more, a thing whitening as it withers, becoming shrill. She runs across the hilly field and the boys follow. I follow them and god, they can run. In following her wind, I am a kite. A girl runs. Two boys chase her. One of them knows her. The other does not. I am their witness. I am not the one to which this happens. Like a tree whitening as it withers, the whitening happens more to the viewer than to the tree or the winter. The shrilling grows loud. Heavy bee. Heavy hills. Breathing like thuds one after the other, the sound of the ground shaking up footsteps, all footsteps ever been committed. If a girl has been followed across a field, what are her chances? The girl runs, the boys follow, they are laughing. From where I am, they sound like demons. I know her hiding place, shouts the sweet menace, his face fresh as a nettle. They run in a straight line, but the real running happens in all directions, everything fleeing itself in turn, because of danger. Let’s follow them away from here. Let them be here while we disappear. Let’s come back later. A girl could run, two boys could follow, no one would know. Sweet flowers shut down, their factories having worked up a storm. Sweet flowers have filled the bees until heavy. Heavy bees are spilling. Faraway, a window opens to the final bee. A kite is stuck to a girl’s skirt. She is running away. Two boys are two men, there is no difference. Two men are a man and a woman, there is no difference. A girl is running away, she might as well be old. In witnessing, I am interested in their camouflage and their courage. They have neither. They have very little, like skin on bone. Skin most lightly perfumed. A girl is running. A man and woman follow her. As they run, they grow older. I know her hiding place, says one. The girl grows smaller and smaller. I grow larger, a kind of power surviving. A heaviness of air filling with water. Moisture is a signature of rain before and after it happens. Moisture loves girls. Girls love rain. This girl too. I follow her, I follow her, it rains. Whatever she says is forgotten. I know her hiding place. Everything has gone elsewhere. I am here and so is menace. I am sweetness and heavy. A girl is running. A girl is running, can’t she run faster? 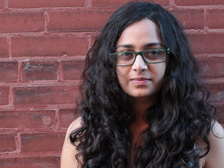 Aditi Machado’s poems have appeared in The Iowa Review, The New England Review, LIES/ISLE, and elsewhere. Her chapbook The Robing of the Bride is forthcoming from Dzanc Books (2013). 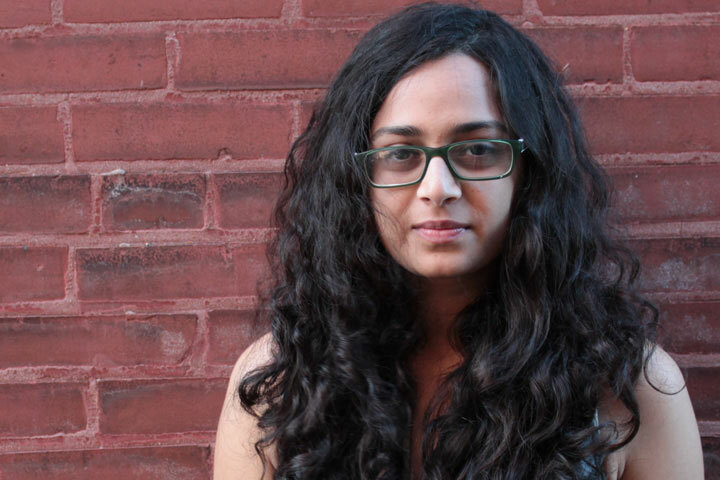 She is the Poetry Editor for Asymptote, a journal of translation. Her website is aditimachado.com.